Our society has been asking for logical thinking, as if it had been logical itself. 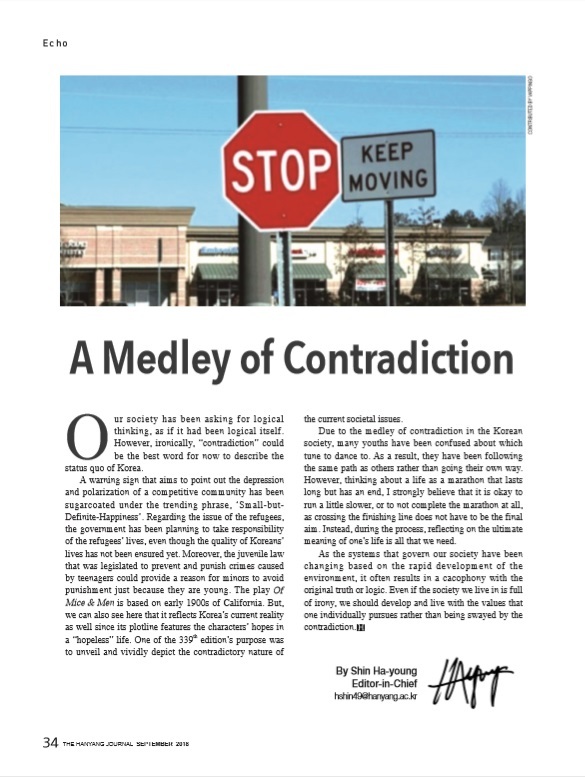 However, ironically, “contradiction” could be the best word for now to describe the status quo of Korea. A warning sign that aims to point out the depression and polarization of a competitive community has been sugarcoated under the trending phrase, ‘Small-but-Definite-Happiness’. Regarding the issue of the refugees, the government has been planning to take responsibility of the refugees’ lives, even though the quality of Koreans’ lives has not been ensured yet. Moreover, the juvenile law that was legislated to prevent and punish crimes caused by teenagers could provide a reason for minors to avoid punishment just because they are young. The play Of Mice & Men is based on early 1900s of California. But, we can also see here that it reflects Korea’s current reality as well since its plotline features the characters’ hopes in a “hopeless” life. One of the 339th edition’s purpose was to unveil and vividly depict the contradictory nature of the current societal issues. Due to the medley of contradiction in the Korean society, many youths have been confused about which tune to dance to. As a result, they have been following the same path as others rather than going their own way. However, thinking about a life as a marathon that lasts long but has an end, I strongly believe that it is okay to run a little slower, or to not complete the marathon at all, as crossing the finishing line does not have to be the final aim. Instead, during the process, reflecting on the ultimate meaning of one’s life is all that we need. As the systems that govern our society have been changing based on the rapid development of the environment, it often results in a cacophony with the original truth or logic. Even if the society we live in is full of irony, we should develop and live with the values that one individually pursues rather than being swayed by the contradiction.